Inspired by the Tree of Life, these elegant Origin earrings feature twisting silver vines finished with a 9ct rose gold ends reminiscent of both leaves and hearts. Made from precious Welsh Clogau gold, these intricately crafted are finished with a trio of white topaz and a subtle topaz centre. 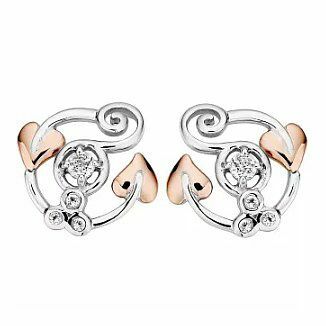 Clogau Silver & 9ct Rose Gold Origin Earrings is rated 5.0 out of 5 by 1. Rated 5 out of 5 by Anonymous from Lovely size for stud earrings. Very noticeable for stud earrings, lovely craftsmanship and comfortable to wear.